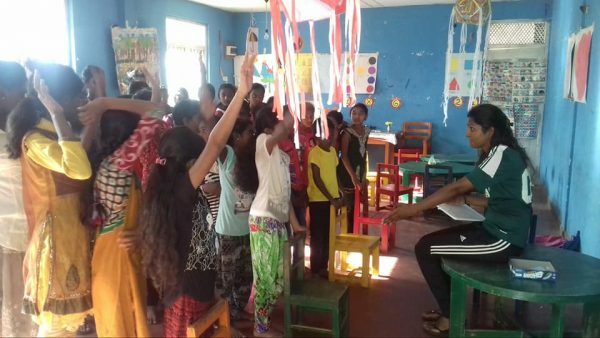 Sunitha Subramaniam reflects on her current experience volunteering as a Leadership Facilitator in Uda Pussellawa, Sri Lanka. I cannot believe it’s been merely a month since I landed here in Uda Pussellawa to work with local partner, the Church of the American Ceylon Mission. Uda Pussellawa is an impoverished town in the Central Province of Sri Lanka. I am working closely with the children and youth in Amherst and Waldemar estates. When I started my journey, I was naive to the impact this experience would truly have on my life. My programming has been focused on English as a second language, youth leadership and developing critical and creative thinking skills. Along with staff and teacher training, we are able to improve access to basic education and enriching extra-curricular activities all the while shaping my personal mindset not only on the Sri Lankan community but my outlook on the world I live in today. I cannot put into words the mix of emotions I’ve felt over my past four weeks here from seeing the extreme poverty in the hill countries, the energetic children, the grossly under resourced schools, the hardworking and under-served community, and the big hearts staff and teachers carry. Moreover, my own privileged life and the assumptions and biases I arrived with have given me a lot to reflect on. Most of all, how eager the whole community has been to learn from my expertise and knowledge in the education field has been a humbling experience. Students are eager to learn every minute and absorb as much as they can as it is helping to shape their lives. The passion in the children and teachers’ eyes has truly been contagious. The teachers want to learn about best practices to support their children to achieve their full potential. Adults in the community are looking to improve their English by engaging in conversations and games and are open to learn in dynamic ways. My philosophy that education is the key to change has been strengthened and solidified by this experience in the Sri Lankan community. If you have been following my social media stories, you already know about the engagement and energy level of the children and some of the programming we’ve been engrossed in. Following my placement at the end of this month, I will be looking into putting together a dense resource manual for the teachers and staff to continue the work we have already started. I am looking to purchase some much needed resources and materials for the programming prior to my departure. Throughout my time here, I’ve noted a few things that will be essential to providing quality programming for the students in addition to the training of teachers and staff. They include anything from books, stationary to media speakers. For any of you who are touched by this and would like to contribute to this wonderful cause, my gofundme page is still active for the “Education as the Changemaker” campaign. Any contribution will go such a long way for this community who is in dire need: https://www.gofundme.com/education-is-the-changemaker. With three weeks left of my journey, I’m hoping to continue with making an impact in this community as well to explore ideas on how to stay connected and engaged once my placement comes to an end. Any suggestions and ideas are welcome. Lastly, for all those that have reached out to me or are engaged in my stories, I strongly urge you to consider giving your time and expertise as it is the most valuable resource this country and its children need. Please check out comdu.it or reach out to me if you are interested in leveraging your skills and knowledge for the sustainable development of communities in Sri Lanka. I guarantee you it will be a life changing and experience – that much I promise you. Inspire action. Inspire leadership. Inspire community development.